Sending holiday gifts to the family can be nerve wracking. You never know what everyone else is getting them, and can't seem to quite remember what they want. 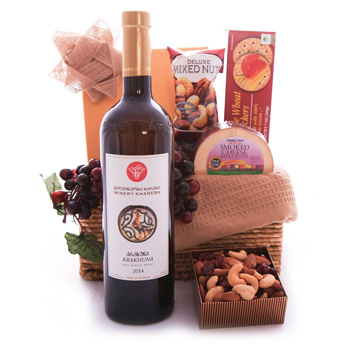 This year, eliminate the stress from your gift giving by sending gourmet gift hampers everyone will love. Your recipient will receive a fine bottle of dry white Georgian Wine (750 ml), smoked Cheese (170 gr), earthy mixed Nuts (75 gr), a box of mixed Chocolates, and more. Celebrate Christmas, reward your team, or surprise a friend with Georgian Gourmet.